There’s a lot for Terminator fans to be excited about these days with the recent release of the Terminator: Genisys trailer. However, with all of the excitement over the new film (and a bit of fear, let’s be honest), you might not have noticed the Nike Vandals Kyle Reese was wearing in the trailer. If you take a closer look, they might look a bit familiar. Did you catch that the Nike Vandals Kyle Reese is wearing in the Genisys trailer are the same Nike Vandals he was wearing in the original Terminator? If you didn't, apparently you totally should have, because getting those kicks back on the big screen was a bit of a battle between the film's costume designer and Nike. If Nike had gotten their way, he would be wearing a different shoe entirely. 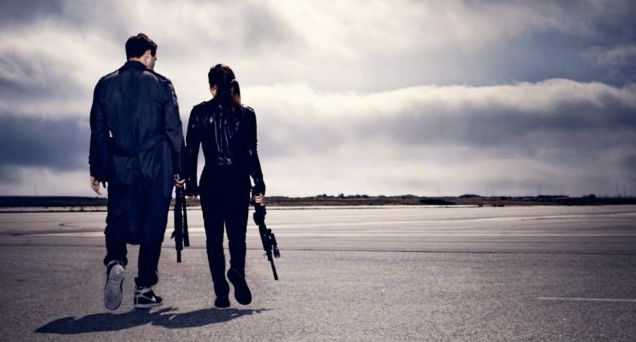 Luckily, the Genisys costume designer, Susan Matheson, wasn't afraid to face off against the shoe production giant to keep the film's costumes authentic. Matheson had planned to design a Nike Vandal identical to the Nike Vandals we see in the original Terminator. However, as she tells i09, Nike originally wanted Matheson to design a shoe based on the Air Force One--an entirely different sneaker. This simply would not do for Matheson. She put her foot down. Knowing how iconic and easily recognizable Reese’s shoes are in that photo booth scene from the original Terminator, she knew fans would immediately notice a similar-but-different shoe. So, she said that was unacceptable and made it clear she would be willing to fight it out. Even more than that, Matheson credits films like Terminator for inspiring her to get into moviemaking and costume design. Keeping the costumes--even down to the sneakers--authentic was so important to her that she stood her ground, telling Nike that without the original Vandal sneaker, there was essentially no point in her designing for the film. You’ve certainly got to give Matheson some extra credit for wanting to make Terminator: Genisys as authentic as possible (which is important given the fact that the plot of the new film seems utterly insane--I’m not sure if it is good or bad insane just yet), and it seems Matheson’s commitment to authenticity paid off. Nike halted production of the Air Force One shoe, and made an exact replica of the Nike Vandals seen in the first Terminator. With all of the new timelines and changes to Genisys, it’s nice to know that we can at least count on seeing the same old Vandals when Genisys hits the big screen on July 1, 2015.